For over three decades, Stress Engineering has been a leader in the design, analysis, testing, and monitoring of pressure vessels and piping systems. In addition, many of our engineers have, and continue to, actively serve on a number of ASME and API committees that are focused on the development of Pressure Vessel and Piping codes and standards. This commitment and experience goes to work for you to ensure that your pressure vessels and piping are operating safety, reliability and profitability. Vibration, wind, seismic, and other calculations to complete a Code design report that will comply with the owner’s specifications and Code requirements. Thermal, fatigue, vibration, wind, seismic, and other calculations to complete a Code design report that will comply with the owner’s specification and Code requirements. 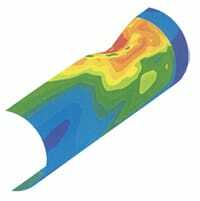 Linear and non-linear Finite Element Analysis (FEA) is used when required. Stress Engineering has served on the SubGroup – High Pressure Vessels for over 20 years continuing to develop the ASME Code, Section VIII, Division 3. We can help you in these applications, generally over 10,000 psi. Metallurgical expertise and intimate knowledge of structural performance gives Stress Engineering the capability to perform design-by-analysis for diverse applications. 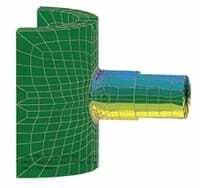 Thermal, dynamic, seismic, and other piping system design calculations are offered for industrial installation. Our experiences in numerous piping research projects have validated our analysis techniques. At Stress Engineering Services we use FEA or testing to evaluate your existing vessels and provide guidance for continued use. We use the National Board Inspection Code (NBIC) and API-510, API-570, and API-653 Codes for analysis and reconstruction. Full-scale testing of damaged vessels has given our engineers expertise with residual stresses and local thin area effects. Fitness for service, and remaining life evaluations can be provided. Numerous field pipe testing projects have given us the experience needed for interpretation of test results on equipment suffering from corrosion or vibration. Our mechanical integrity services are based on the principles of fracture mechanics, metallurgy, and an understanding of inspection realities. Strain gage testing, field metallography, material testing, and acoustic emission testing are often used to supplement stress analysis. We are experienced in high temperature applications where creep and stress rupture are important. We have performed several research projects for the Pressure Vessel Research Council in this area.